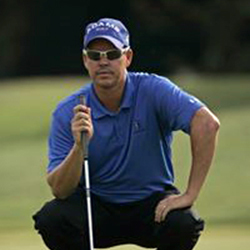 Brad Ott:	Hi this is Brad Ott, director of instruction here at TPC Craig Ranch in McKinney, Texas. I want to talk to you about speed control. A lot of my students, a lot of my amateurs and playing on tour for years, I'd see this with a lot of the pro and partners I was playing with. I don't see a lot of speed work being done with some of the weekend golfers. This is one of the things I try to encourage my students to do all the time. I've got a pretty fun exercise here. It's a two stick drill, I kind of invented this. What you do, is you have your two sticks out here and they're about a foot apart from each other. The key to this drill, is really has nothing to do with direction or alignment. What you'll do is you'll set up between these two sticks, you'll try and put that golf ball right between them. If you get over the first stick and you stay in between the sticks, that's a successful putt. Normally what I'll have, is I'll have a five foot station, a ten foot station, a fifteen foot station, a twenty foot station for my students and I'll mandate that they get through all four stages. When they get up to twenty foot, then that's a successful speed drill exercise they can do that'll allow them to get a feel for the greens and to control the speed of their putts. Now, something I'll do for more of my advanced players, my collegiate and professionals, and even some of my high school league players, is you're going to have to get the ball between the sticks but you can't touch the back stick. The first putt would've been a successful one. But if you were to putt one through the sticks and you get it over the first one but it touches the back stick, that would be a failure in the advanced stage. What I would encourage you to do in the beginning, just get between the sticks. Try to get to at least twenty foot. What I'll do again with my students, have a five foot start right here. They can't move to ten foot station until they get three in a row. Then you have a ten foot station, you got to get three in a row. Once that becomes fairly easy for them to get by twenty foot, then we go to the advanced model. That's where you can't touch the back stick. You're trying to putt the ball over the first stick, but you can't touch the back stick. If you can harness that speed control, five, ten, fifteen, twenty to where you're getting inside the sticks without touching the back stick, you're going to have exceptional speed control. It should really improve your putting.